When it comes to roof windows, any professional roofer will tell you that an excellent finish relies as much on the tools and materials used to install the window as it does the quality of the window itself. That’s why we offer an extensive selection of high-quality installation products for roof windows, to accompany our range of roof windows. Our range includes underfelt collars, to prevent gaps in the join between the window frame and the roof, as well as vapour barriers designed to reduce condensation. All of these products are created to make your window as airtight as possible. 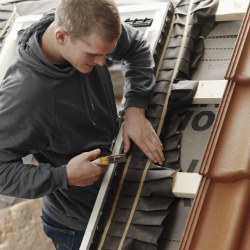 We offer the same fantastic trade prices to all of our customers, regardless of whether you’re a professional roofer or a skilled DIYer. If the latter applies, we also offer bulk pricing, to help you make even more savings. Contact us today for more information on any of our products or to obtain free, impartial advice. You can also place your order for installation accessories for roof windows online.